Billed as the “Holy Grail of pop culture”, Ernest Cline’s popular 2011 novel Ready Player One has recently received online criticism that’s… well, considerably less than holy. Though praised at the time of its release, many angry Twitter users have since expressed their disdain and frustration with Cline’s questionable writing skills, noting the bloated and clunky writing style as well as an overwhelming amount of pop culture references including everything from Pac-Man to Blade Runner and so on, and an alarming treatment of certain behaviours by main characters that are generally considered to be inappropriate but are never called out for being so. As someone who hasn’t read the book, but has instead read quite a few of those tweets taking aim at the book, I get the overall impression that maybe it was wise of me to skip it before seeing this movie. But even then, from what I hear about the book, Steven Spielberg’s major new adaptation alters quite a few of the things people go so worked up about in the first place (although I’m sure someone reading this online is bound to correct me in some way shape or form), and have made it at least a bit easier to digest for a much wider audience. For the most part, it seems to have paid off; Spielberg’s Ready Player One is a fun and largely enjoyable movie-going experience which, while not without some severe flaws, is bound to please audiences with its dazzling visuals and simple story. Set in the year 2045, society has gone so rapidly downhill, that people are frequently escaping to a virtual reality called the OASIS, which enables its users to do anything they so please, from skiing down pyramids to escalating Mount Everest with Batman, and be anyone they want, whether it’s a different gender or a mythical creature or a major pop culture icon like the Iron Giant, Freddy Krueger, Marvin the Martian, the list goes on. But there’s an extra little activity for those who are willing: OASIS founder James Halliday (Mark Rylance) had hidden three Easter Eggs throughout the system shortly before his death, and has tasked its users with finding them. The prize? Complete control over the OASIS and its trillion-dollar empire, which of course makes it the hottest contest in the world, with everyone from mere users to big corporate bigwigs competing against each other to find the Easter Eggs. However, one such eager treasure hunter, teenager Wade Watts (Tye Sheridan) who in the OASIS is known as Parzival, discovers a hidden clue that propels him straight to the leader’s position, and garners him attention both wanted and unwanted by other OASIS users like Art3mis (Olivia Cooke), and sinister businessman Nolan Sorrento (Ben Mendehlson) who wants control of the system for his own purposes and will do anything to secure it. Ready Player One is many things all at once: a treasure hunt movie, a haven of pop culture references left and right, a video game flick, a Black Mirror-style satire on the over-reliance on technology, a YA teen film, and – most appropriately – a Steven Spielberg picture. After a brief period of making purely awards season fare with the likes of Lincoln, Bridge of Spies and The Post, the beloved director is firmly back in crowd-pleasing blockbuster mode with this film, and he manages to just about juggle all of these elements together well enough – although with far more focus on some over others – to make a movie that, tonally and in spirit, feels much closer to the likes of Jurassic Park, E.T., and even some of his producing credits like Back to the Future and Who Framed Roger Rabbit (even going so far as to hiring Alan Silvestri, the composer for the latter two films, to score this one in regular composer John Williams’ stead). This is pure Spielberg fun from start to finish, as you’re constantly fascinated by the imagination that went into the visuals alone, and while the story may not be particularly groundbreaking or fresh – think of it as Charlie and the Chocolate Factory but with extra lives – like some of Spielberg’s most popular blockbusters it is simple enough to just about follow competently enough. The vast pixelated world in this movie is certainly awesome to experience, from an exciting early car race with nearly every recognisable vehicle in pop culture from the DeLorean to one of the motorcycles from TRON, to – in what is easily the best sequence of the entire movie – an inspired journey into the world of Stanley Kubrick’s The Shining which by itself is worth the ticket price alone. There’s lots to enjoy about this movie, although don’t get too carried away as it isn’t perfect; in fact, there are one or two fundamental flaws that prevent it from being a truly great movie. For one, it takes a very long while to get into; much of the first half of this movie is made up of exposition dialogue that’s made up of explaining how the OASIS functions, which doesn’t leave much room to make many of these characters interesting or worthy of following for the next two-and-a-half hours. You feel like you’d much rather just experience the whole thing for yourself, instead of being told everything you need to know like the most convoluted instruction manual for a PS4 game ever, which ruins the fun a little bit when you’re forced to take all of this in without the ability to skip ahead. It’s not until the second half of the movie kicks in, specifically around the point when the Shining sequence begins, does the movie really begin to come to life, as up until then it felt just a little bit soulless and not as entertaining as it could have been. As for those pop culture references, which have been one of the many selling points of this movie, there’s certainly a lot of them, sometimes overwhelmingly so, but it never really got to a point where it was completely unbearable. It made just enough sense as to why there were so many recognisable figures wandering about in the background, as this is meant to be a world where anyone can be and do anything they want, and while they’re certainly not integrated into scenes as well as the numerous cartoon characters in Who Framed Roger Rabbit, from the point of view of a certified film geek like me, it was pretty cool seeing so many things like the DeLorean and the Iron Giant sharing the same scenes as each other, on top of the countless other pop culture icons that are all over this movie. Although the heavy inclusion of pop culture references didn’t necessarily bother me, as I felt there were much bigger flaws that harmed the movie more, I could completely understand why anyone would be overwhelmed by any of this, but I don’t think it’s that bad. In the end, is Ready Player One a Spielberg masterpiece? Absolutely not, but this is definitely one of the more fun movies that the director has put out in some years, and to say that it will certainly find its audience would be understating things, as you can tell this was absolutely made for anyone who grew up with pop culture around them left and right, and the majority of them will at the very least enjoy this movie just fine. I certainly enjoyed large chunks of it, and even though it’s not perfect, this is one game I’m willing to play more than one. 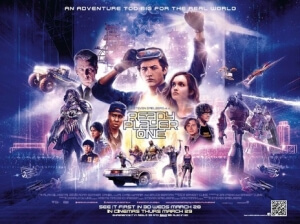 Ready Player One is a fun and largely entertaining blockbuster that ranks among the more enjoyable fare that Steven Spielberg has put out in years, and while it’s certainly got some heavy flaws like an exposition-heavy first half that negates much of the character development, it’s got a lot of pure Spielberg charm to it that will certainly win over audiences who are willing to escape for a couple of hours.